Aspiring scientists will compete for $1.8 million in awards including top prize of $250,000. Indian American whiz kids continue to excel in America availing of the incredible opportunities the nation affords. Now, 15 Indian American high school students out of 40 finalists in the highly-acclaimed Regeneron Science Talent Search are heading for the final competition to be held later this month in the nation’s capital. Over the course of a week, March 8 to 14, the 40 budding scientists will present their innovative research projects to eminent judges, display their work to the public, meet with renowned scientists, and compete for 1.8 million dollars in awards. Winners of the top ten prizes, ranging from 40,000 to 250,000 dollars, will be announced March 13 at a formal gala in the National Building Museum. It is noteworthy that out of over 1,800 applicants for the Regeneron Science Talent Search (Regeneron STS), 300 semi-finalists were selected each receiving 2,000 dollars in addition to their school getting a grant of an equivalent amount. 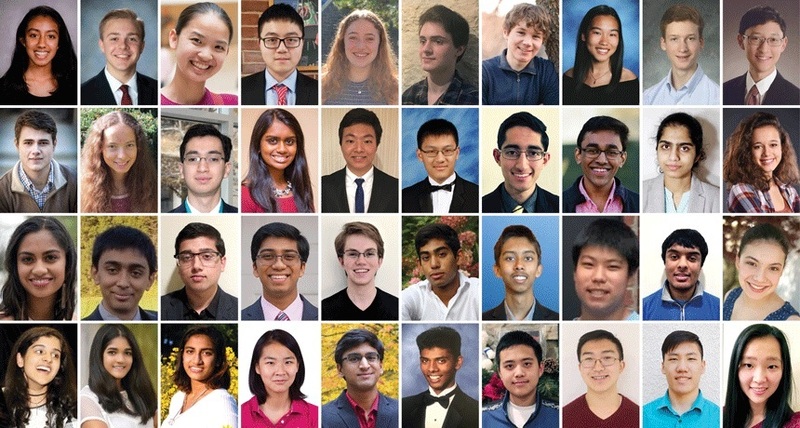 Of these ‘Top Scholars’, 40 finalists were announced January 23 of which 37.5 percent are Indian American kids: Sidhika Balachandar, 18, Buchholz High School, Gainesville, Florida; Kavya Kopparapu, 17, Thomas Jefferson High School for Science and Technology, Alexandria, Virginia; Rohan Mehrotra, 17, Lynbrook High School, San Jose, California; Rajiv Movva, 17, The Harker School, San Jose; Chythanya Murali, 17, Centennial High School, Ellicott City, Maryland; Nitya Parthasarathy, 17, Northwood High School, Irvine, California; Mihir Patel, 17, Thomas Jefferson High School for Science and Technology, Alexandria; Advait Patil, 17, Lynbrook High School, San Jose; Abilash Prabhakaran, 17, Cherry Creek High School, Greenwood Village, Colorado; Isani Singh, 18, Cherry Creek High School, Greenwood Village; Teja Veeramacheneni, 17, Archbishop Mitty High School, San Jose; Vinjai Vale, 17, Phillips Exeter Academy, Exeter, New Hampshire; Marissa Sumathipala, 17, Broad Run High School, Ashburn, Virginia; Shuvom Sadhuka, 18, Cambridge Rindge and Latin School, Cambridge, Massachusetts; and Syamantak Payra, 16, Clear Brook High School, Friendswood, Texas. The STS, a program of Society for Science and the Public since 1942, is the nation’s oldest and most prestigious science and math competition for high school seniors. It was formerly known as the Intel Science Talent Search (1998-2016) and earlier was supported by Westinghouse (1942-1997). Regeneron Pharmaceuticals, Inc., a leading biotechnology company headquartered in New York, took on the STS from 2017 and will be giving 3.1 million dollars in awards on an annual basis. Founded by STS alumni and a true champion of science, the company has committed 100 million dollars in funding over the next decade. Throughout its 76 years, the criteria for selection in the STS has remained the same: students are chosen from across the nation for their scientific prowess and overall potential to become future leaders of the scientific community. Alumni of the program have made extraordinary contributions to science and are recipients of over 100 of the world’s most prized honors in science and maths including the Nobel Prize and the National Medal of Science. In a press statement, Dr. George Yancopoulos, Founding Scientist, President and Chief Scientific Officer of Regeneron, said, “I’ve had the opportunity to meet many of my fellow Science Talent Search alumni who have gone on to become notable scientists and entrepreneurs, underscoring the critical role the program can play in launching a prominent scientific career”. About the 40 finalists, he noted that they “are tomorrow’s scientific leaders, and their projects address some of the most urgent challenges we face as a society. Our world has no greater or more important resource than these bright young minds. I have deep respect and appreciation for each student who conducted extensive scientific research and completed a Regeneron Science Talent Search application”, Yancopoulos said adding that he looks forward to their future achievements as they build on the world-changing accomplishments by STS alumni. — Syamantak Payra: A smart bionic leg orthosis: the design, development and evaluation of an orthotic device for comprehensive restoration of gait characteristics across everyday mobility scenarios.